Planetary scientists have found several spots near the north pole of the moon that receive continuous sunlight during the poles lunar summer, making them prospective locations for future solar-powered equipment, or even a lunar station. 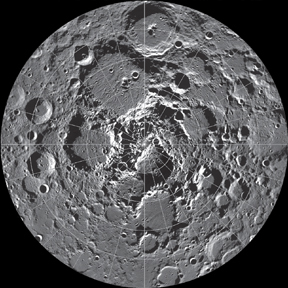 Researchers recently found locations near the lunar north pole, shown here on a photomosaic taken during the 1994 Clementine mission, that experience continuous sunlight during the lunar summer. Courtesy of Ben Bussey, Johns Hopkins APL. Astronomer Ben Bussey of the Planetary Exploration Group at the Johns Hopkins University Applied Physics Laboratory in Laurel, Md., and colleagues used 53 images to produce the first illumination map of the lunar north pole. The images were taken between February and May of 1994 by highly sensitive digital cameras aboard the Clementine spacecraft, jointly funded by NASA and the Department of Defense. The map revealed several small spots on the northern rim of Peary Crater, which lies very close to the lunar north pole, that experience 100 percent illumination during the northern hemisphere summer. What we found was they are constantly sunlit and have the potential to be permanent, Bussey says. Permanent sunlight could provide a source of energy for a lunar outpost. The idea, first studied by NASA in the early 1990s, attracted attention again in January 2004, when President Bush announced his goal of a human mission to Mars, which includes returning humans to the moon by 2020. Permanently sunlit areas represent prime locations for lunar outpost sites, as they have abundant solar energy, are relatively benign thermally (when compared with equatorial regions), and are close to permanently shadowed regions that may contain water ice, Busseys team reported in the April 14 Nature. Astronomers suspected that the moons north pole might have permanently sunlit locations (sometimes called peaks of eternal light) because the moons axis is tilted only 1.5 degrees relative to its orbital plane. This near-perpendicular angle allows high topographic areas to bask in more sunlight, but can also leave topographic lows, such as crater bottoms, in perpetual shade. Studies of the lunar north pole during winter will be required to determine if the locations on the Peary Crater rim truly experience permanent sunlight.